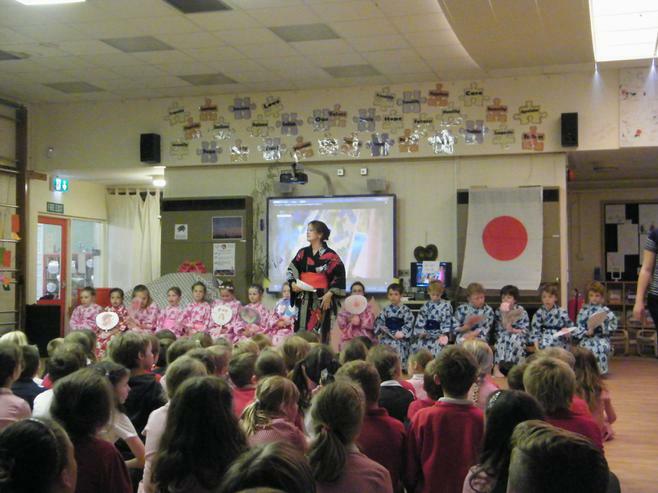 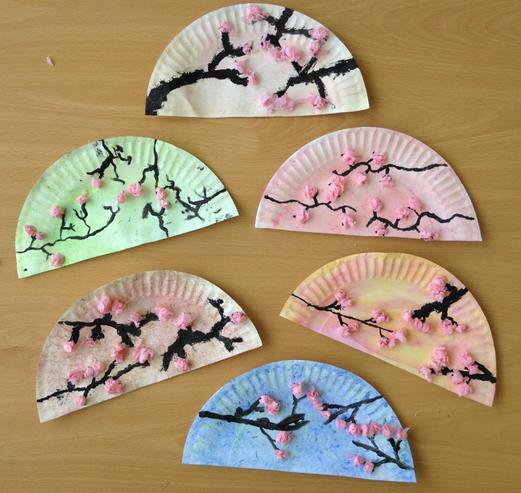 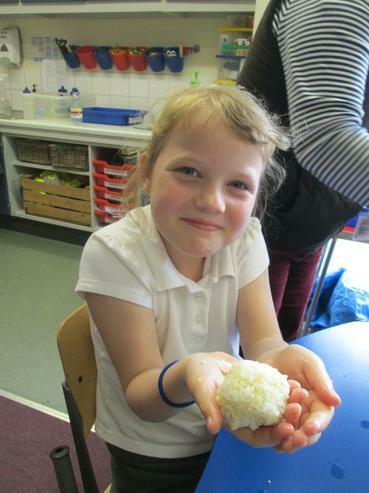 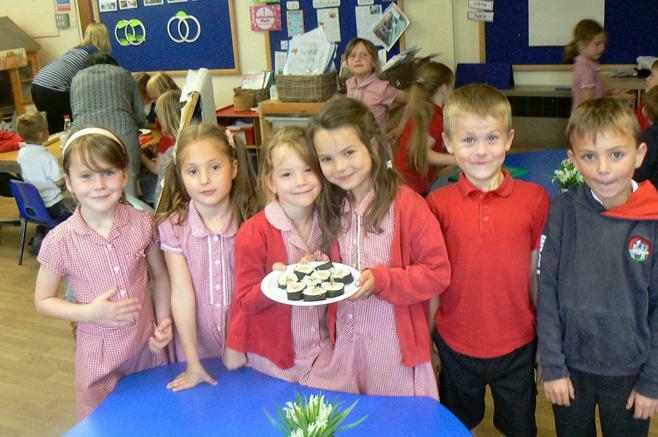 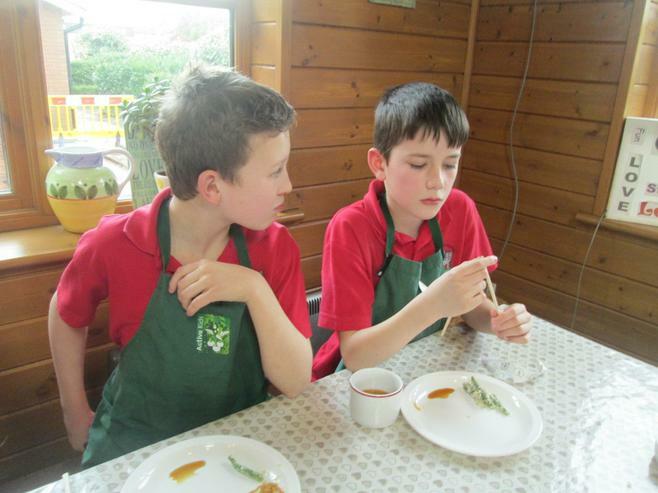 On Thursday 7th July, to coincide with the Japanese festival of Tanabata, Madley Primary School held its very own whole school Japan Festival. 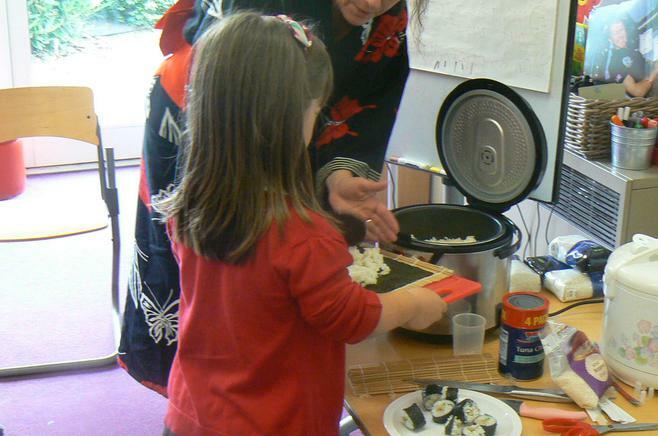 We were honoured by a very special guest, Josephine, from the Japan Foundation in London. 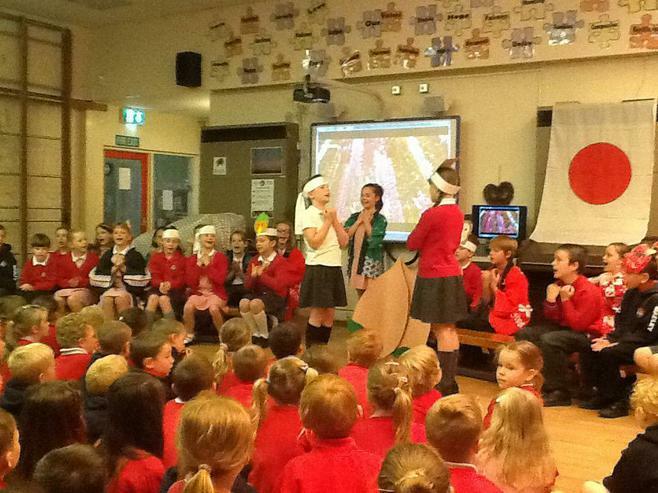 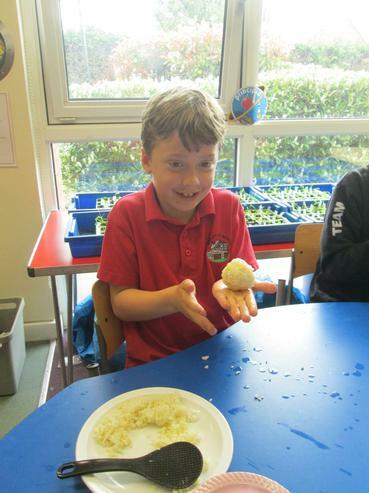 The day started with a performance of the Gigantic Turnip in Japanese (Ookii Kabu) by Class 3. 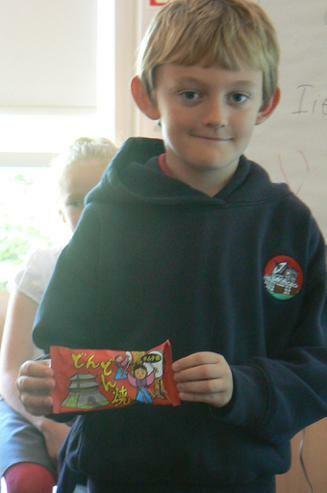 Nancy, Derran and Isabelle then told the story of Tanabata (see below for the clip that they used) and Mrs Morris explained about the wish cards (tanzaku) that Japanese children make. 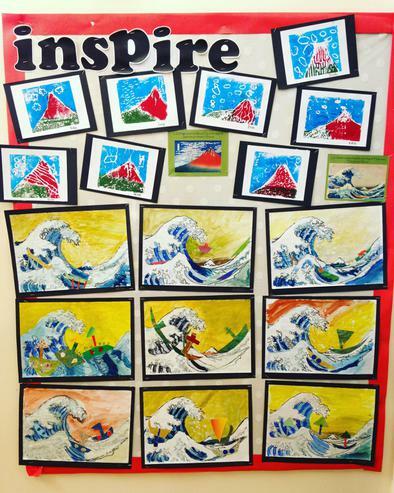 Every child in the school would make a tanzaku and hang them on the bamboo in the hall - it looked amazing by the end of the day! 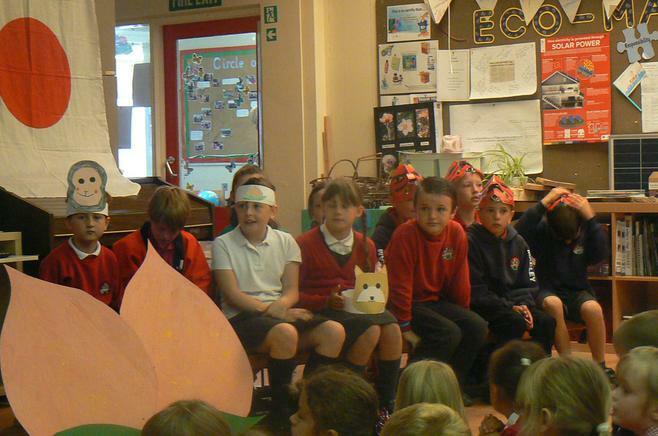 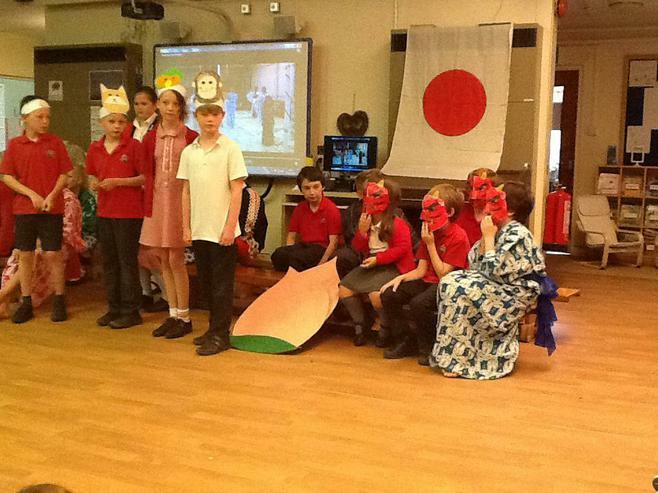 Next, Class 4 performed the traditional story of Momotaro (Peach Boy) in Japanese and English, a play written by us with the help of Mrs Terry. 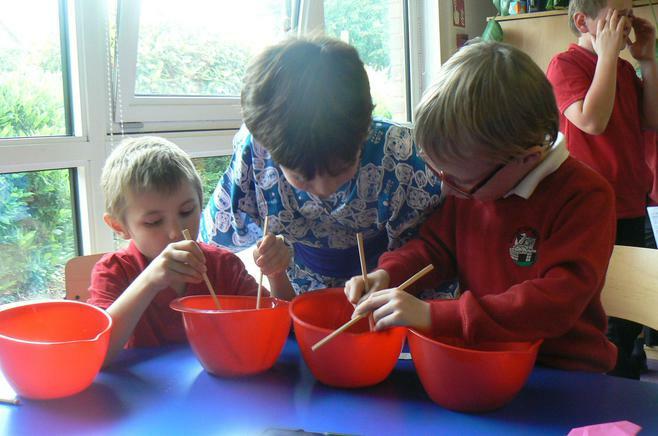 After assembly, each class started to make their tanzaku. 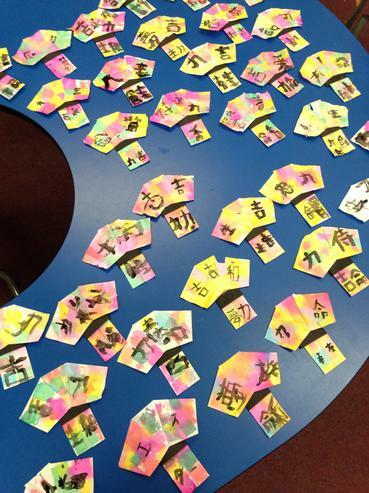 First, they copied the Japanese symbols for harmony, friendship or trust on their cards - these are some of our school values. 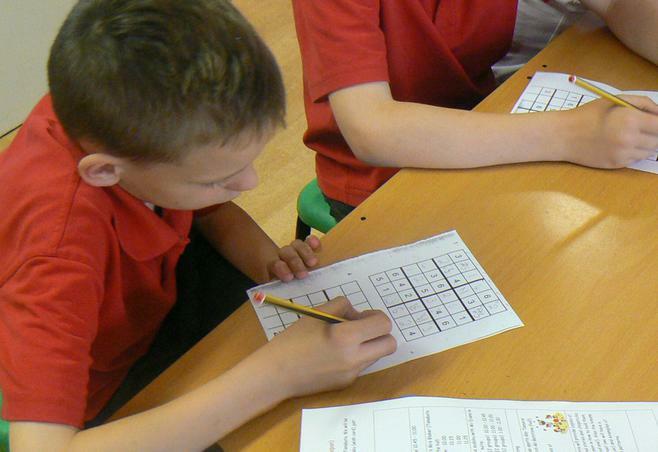 Next, they wrote their wish for the next academic year on the back. 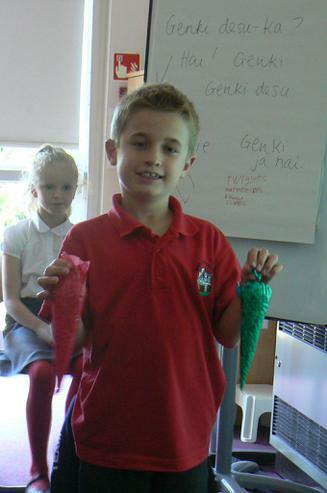 Finally, they added origami to the bottom - each class did a different origami animal. 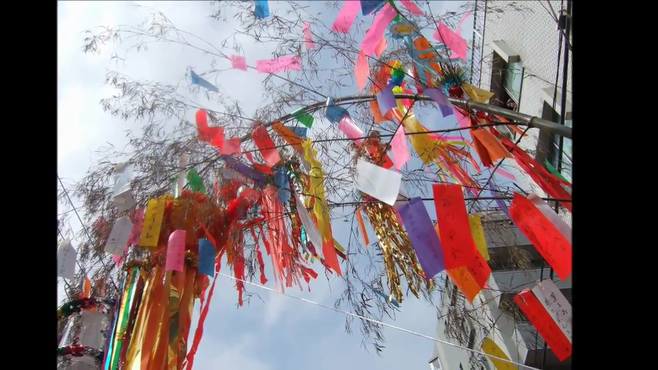 Before long, the bamboo in the hall was full of multi-coloured wishes. 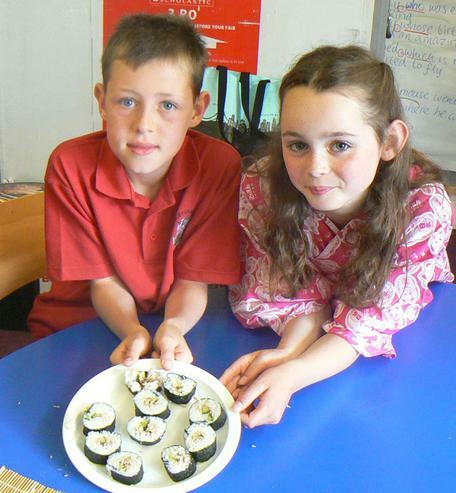 Over the course of the day, the classes also had music lessons to learn the tanabata song (you'll find the song clip and the words at the bottom of this article); maths lessons - solving Sudoku puzzles; some classes made delicious sushi; and every class had the chance to take part in the chopstick challenge, with chopsticks for each child to take home. 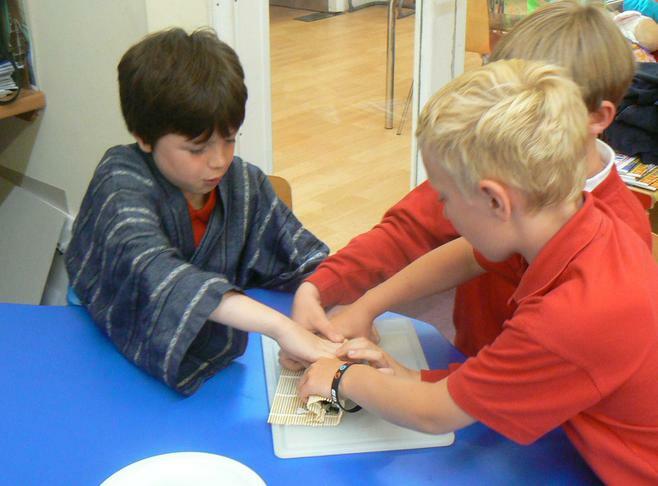 We also had games of tamaire (a Japanese sports day team challenge involving lots of coloured balls and a bucket) going on in the hall and a kimono design competition. 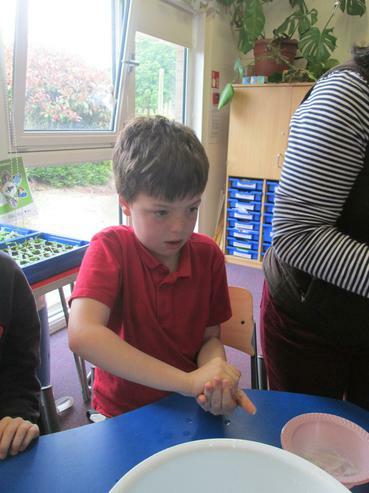 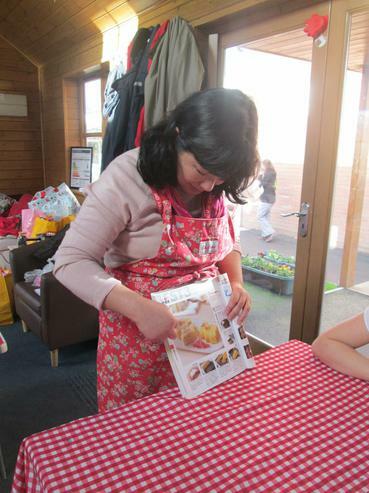 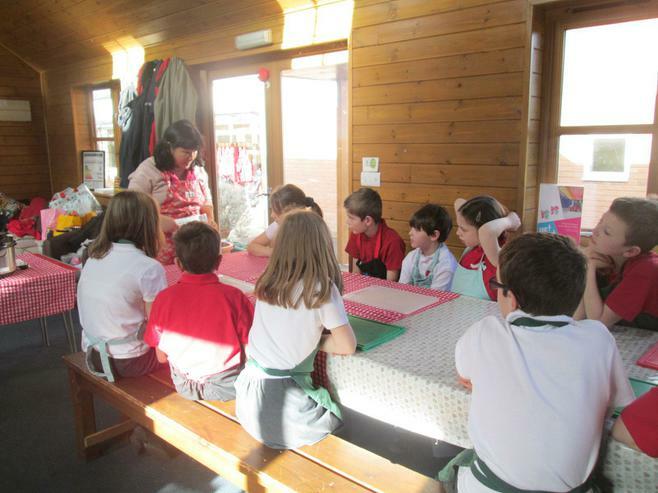 The school was a hive of activity! 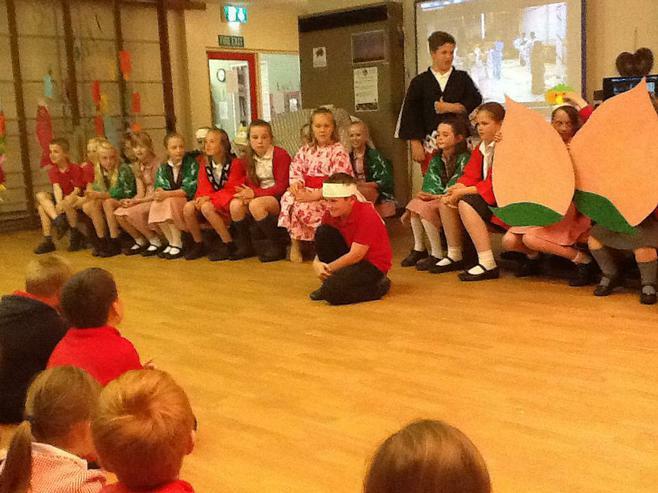 Towards the end of the afternoon, we gathered in the hall again. 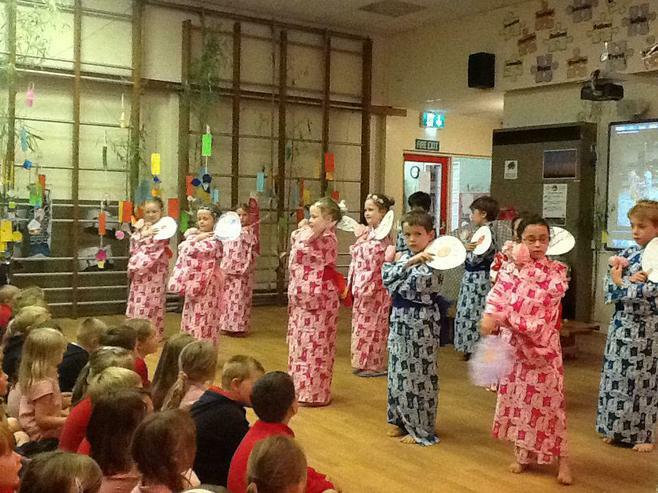 This time, Class 5 performed the Momotaro (Peach Boy) play, but first it was the turn of the children who attend the Year 2 Japanese Club to dance to Sakura in their summer kimonos with fans they had designed. 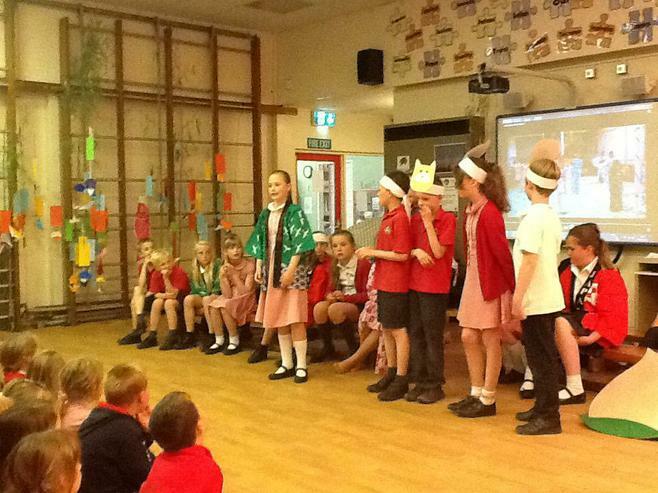 What a wonderful festival! 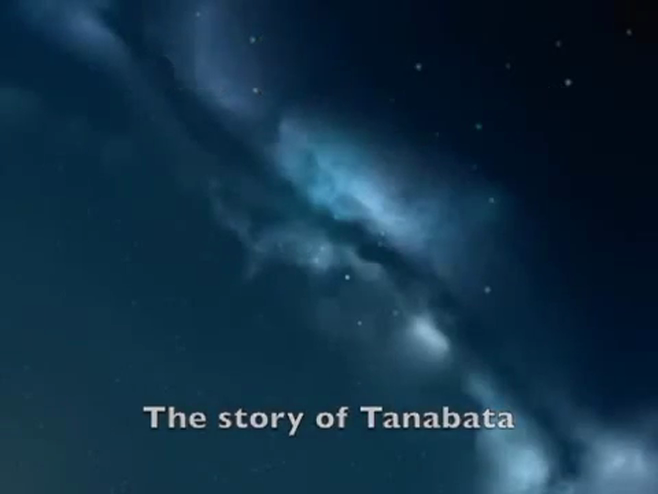 Use this clip to help you to learn the Tanabata song! 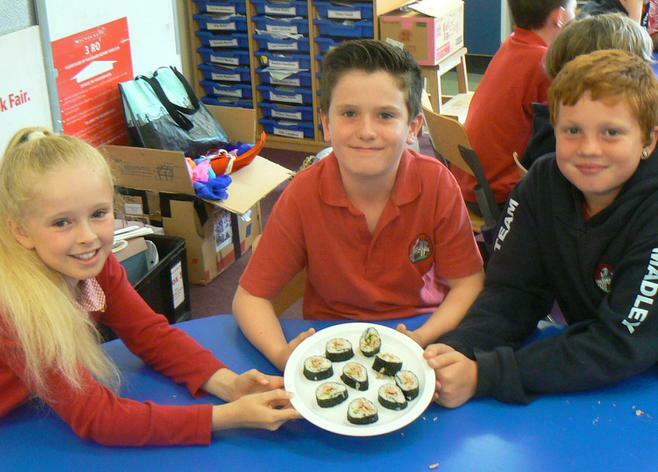 Welcome to Japanese club, Year 2! 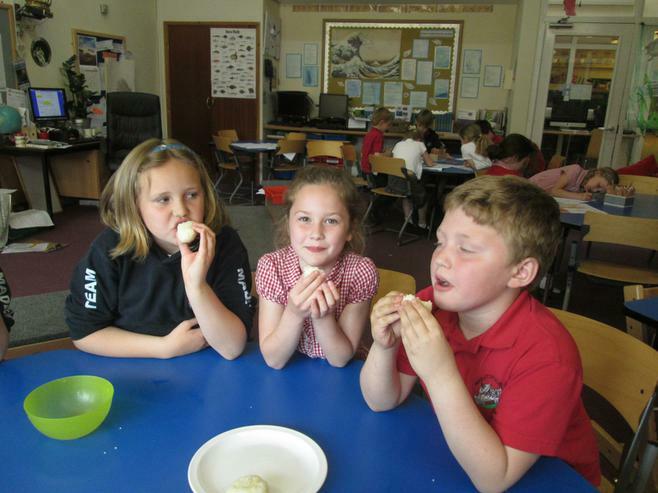 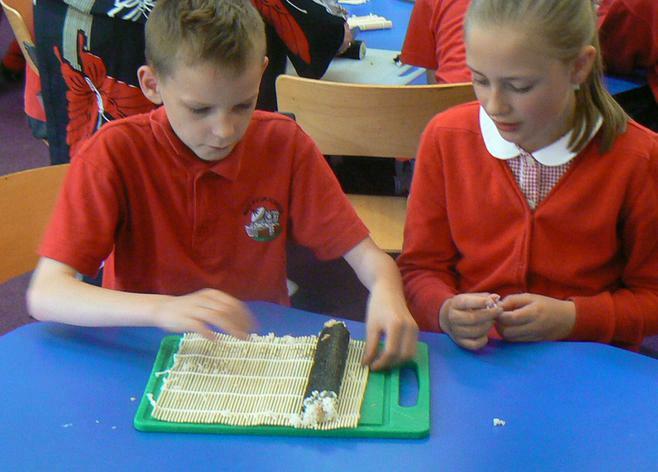 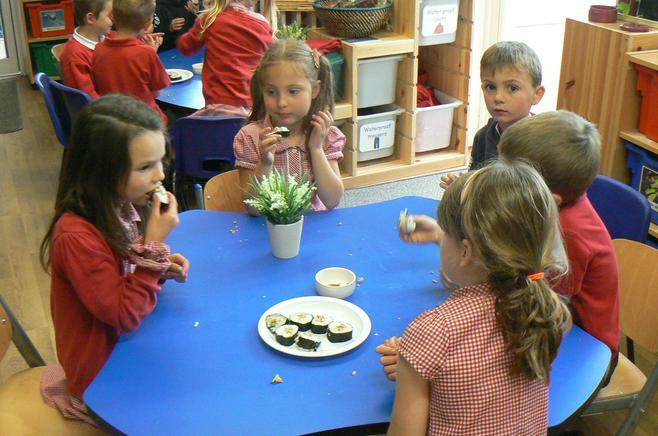 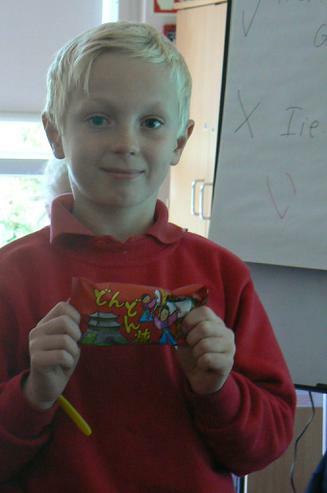 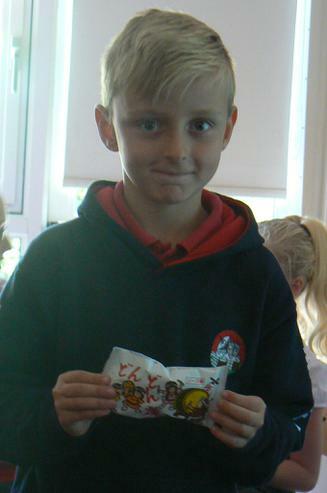 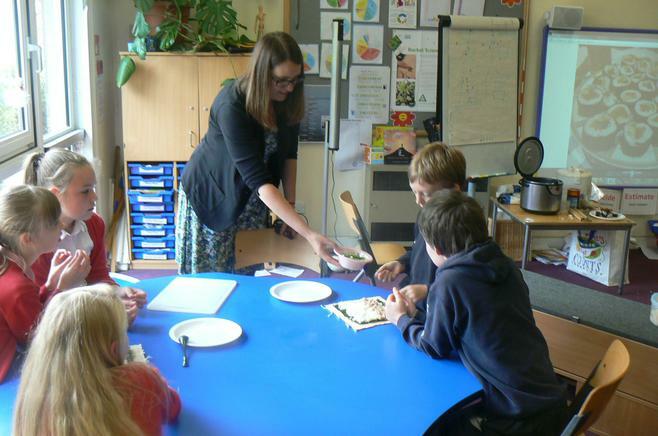 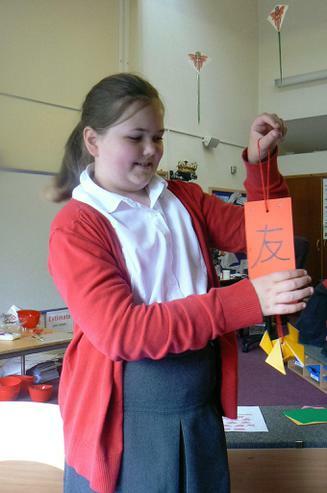 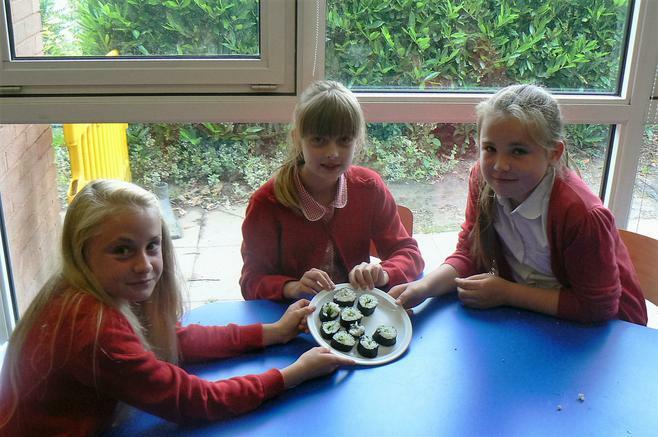 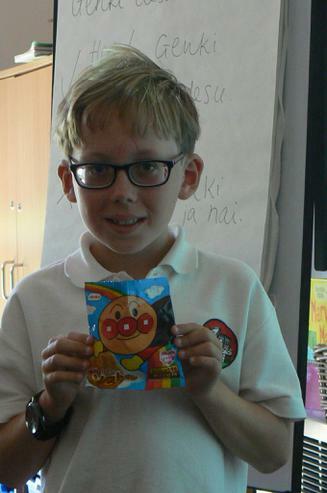 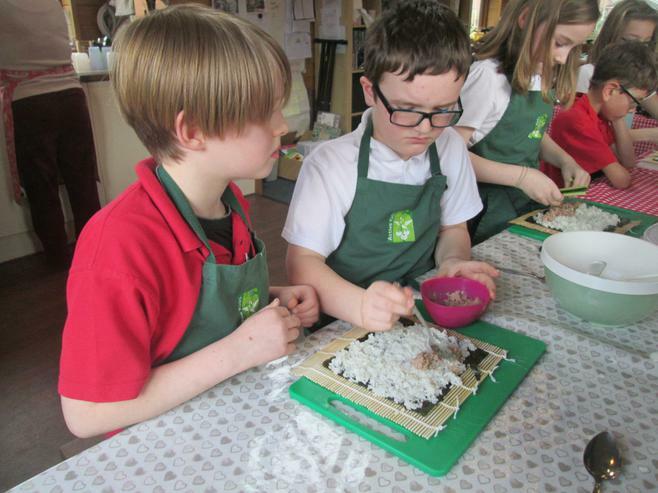 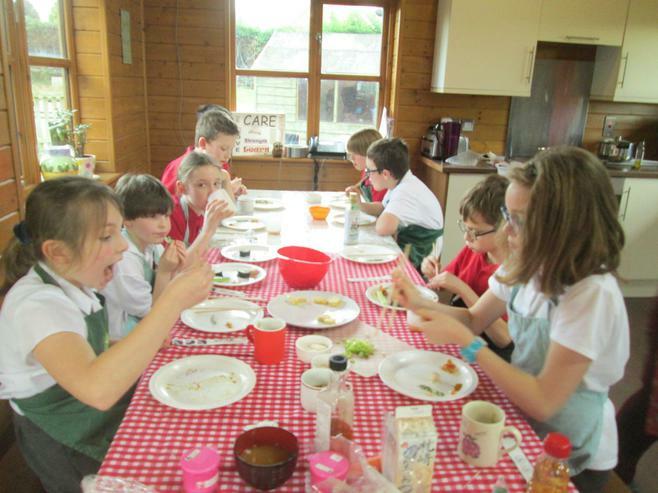 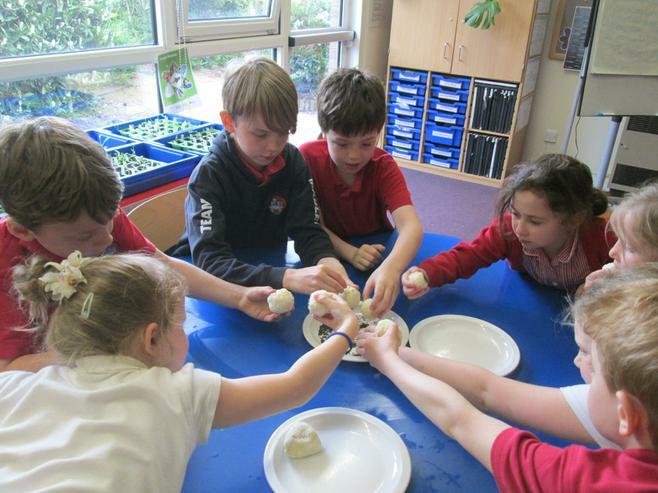 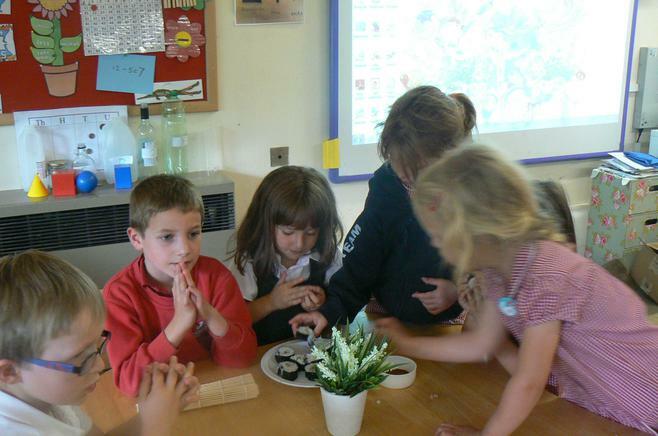 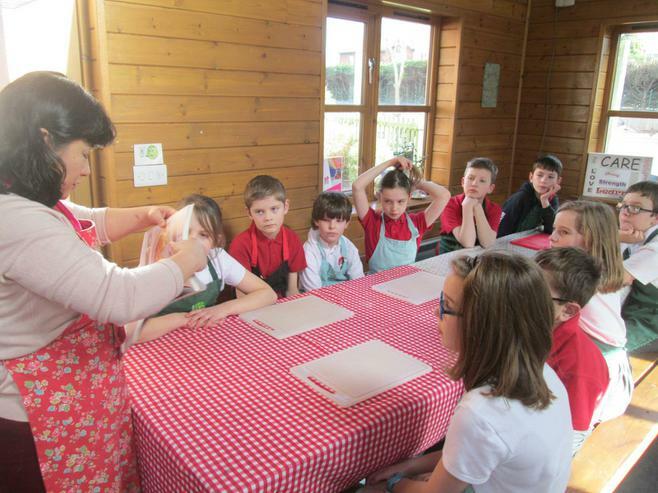 Children in Years 3, 4 and 5 at Madley Primary School are learning Japanese as part of their curriculum. 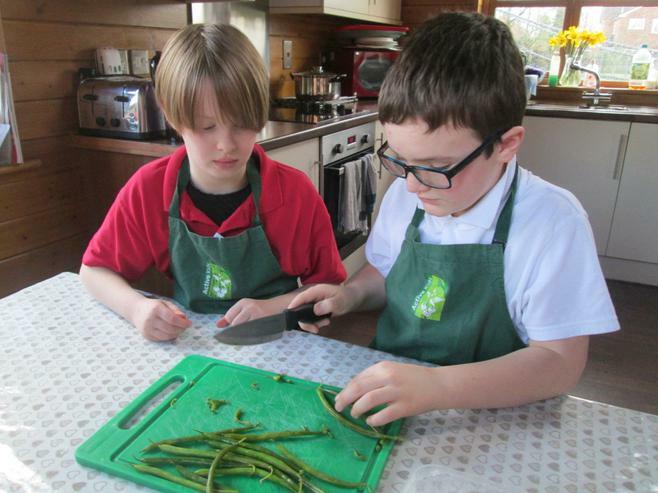 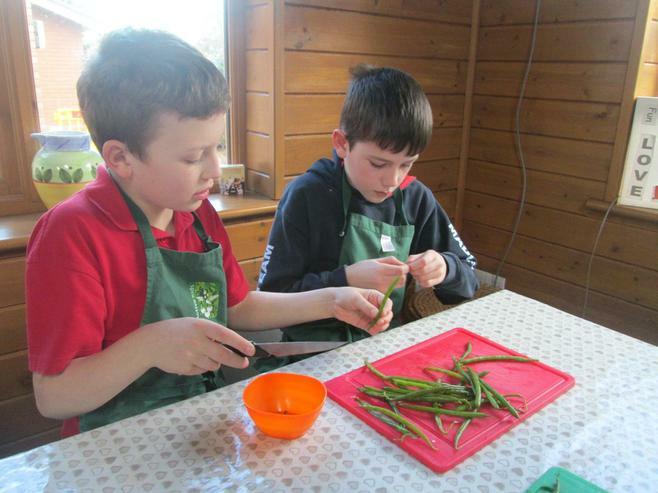 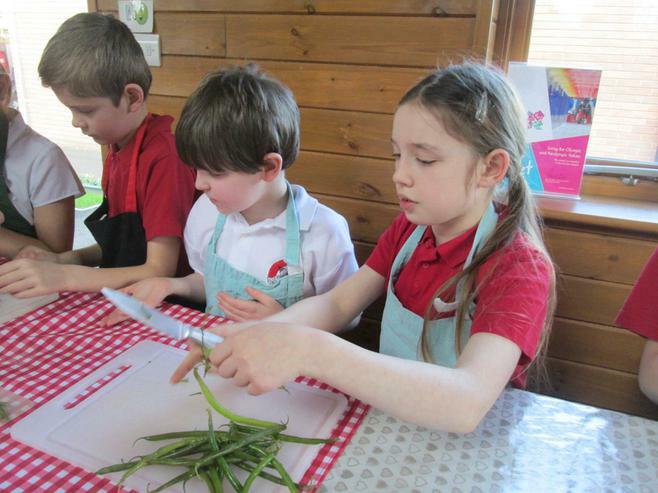 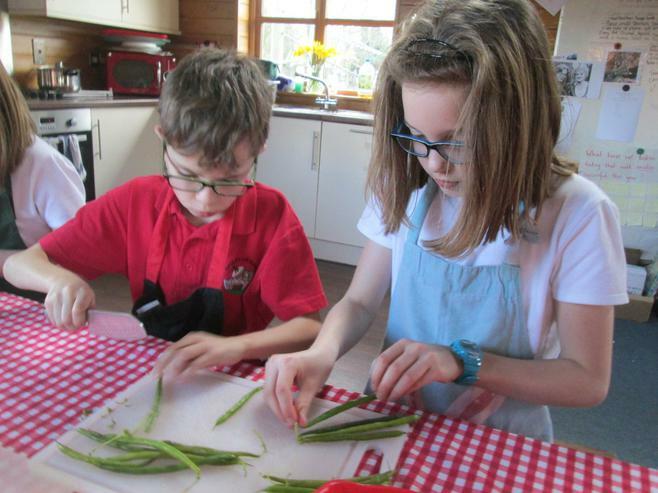 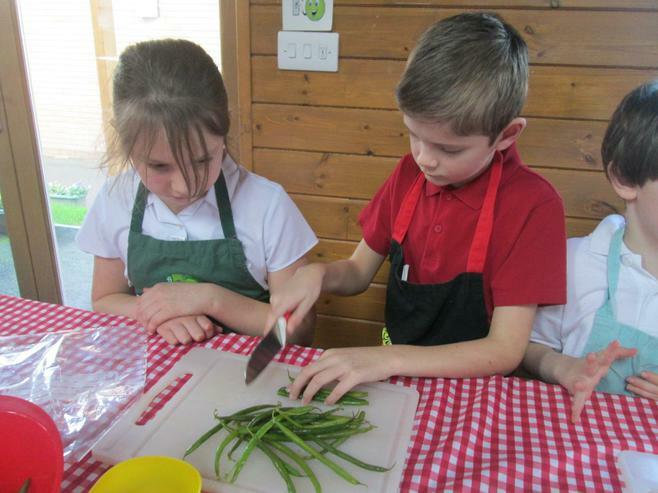 For Years 4 and 5, it's their second year of learning. 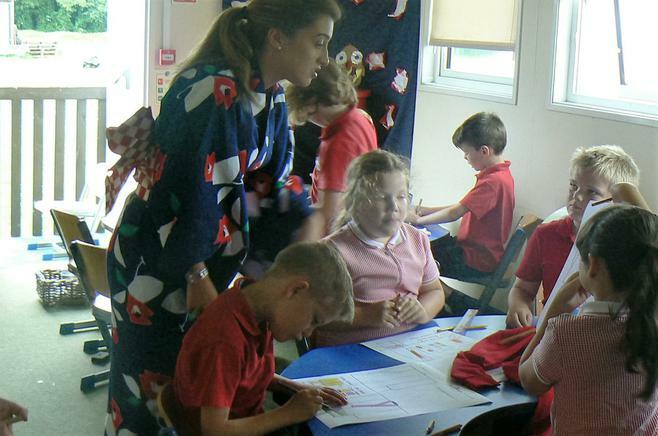 This year, thanks to a grant from the Japan Foundation, we have been able to employ a native Japanese teacher, Mrs Miho Terry, to help Mrs Morris and Miss Matthews in our Japanese lessons. 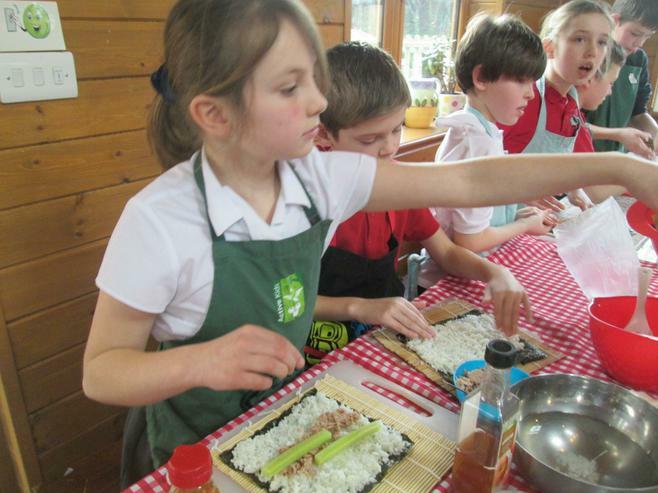 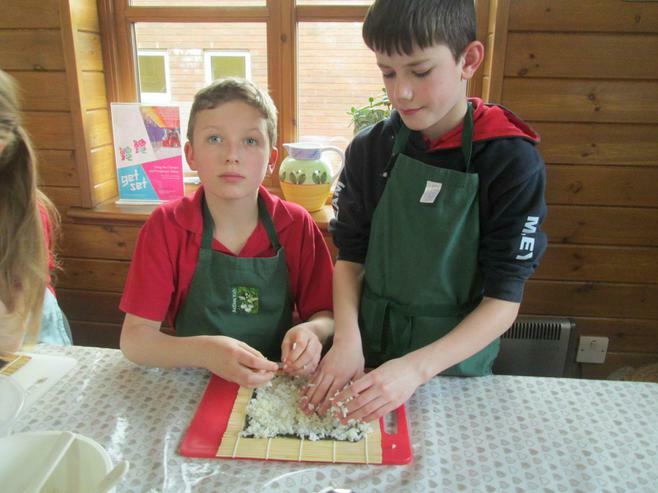 We have also been running a popular Japanese Club after school for two years. 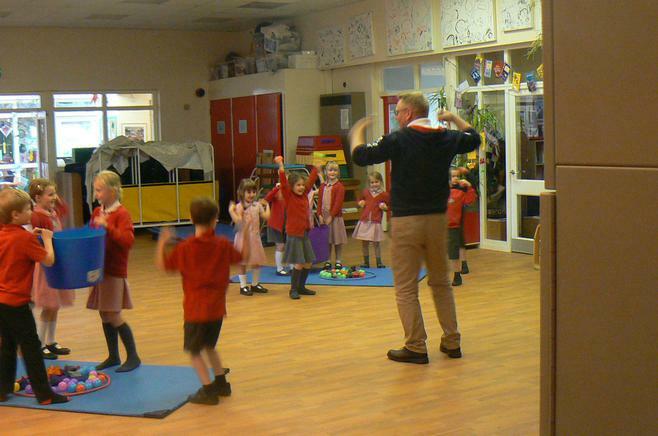 This takes place on Tuesdays after school. 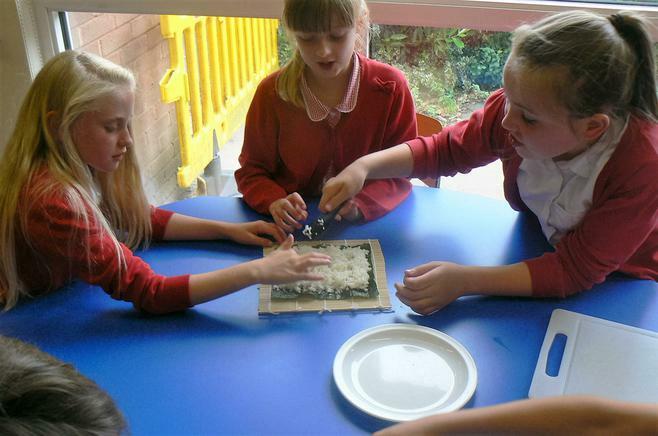 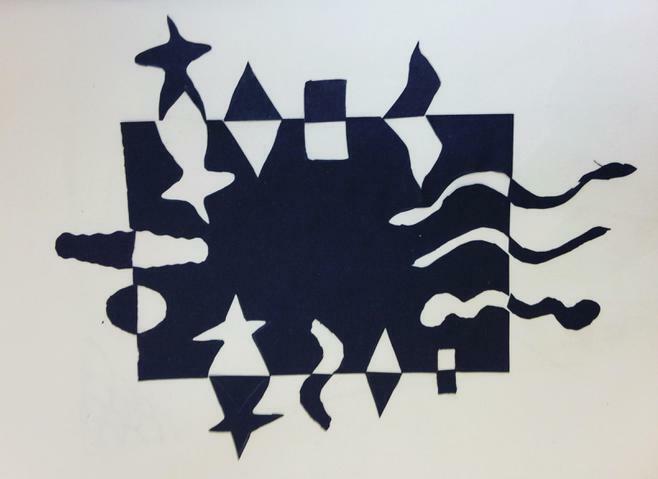 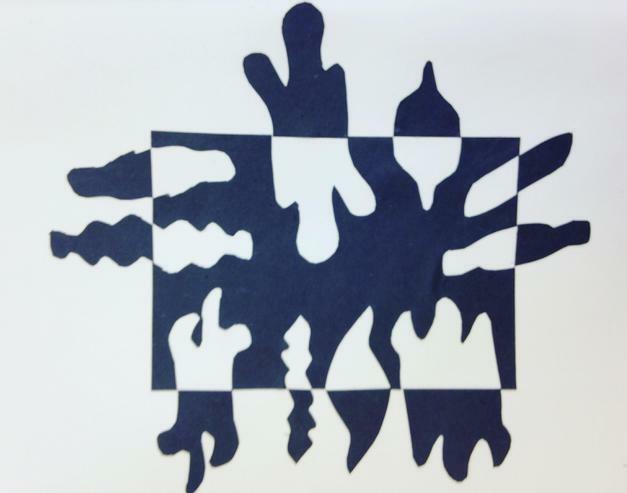 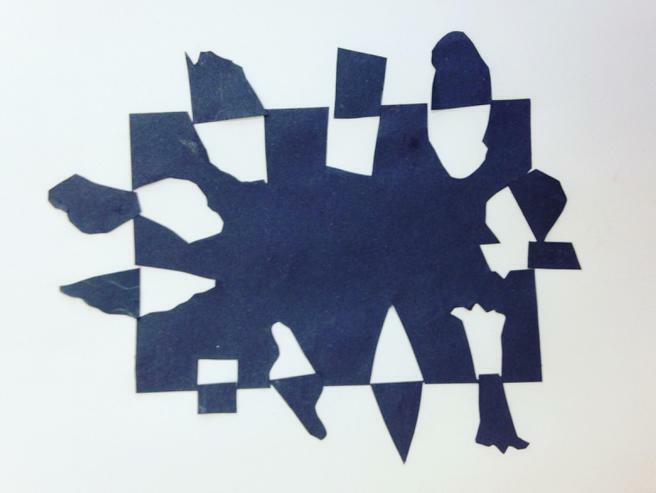 Origami Club Have fun with origami - this website shows you how to make lots of different designs and includes videos to show you the right folds! 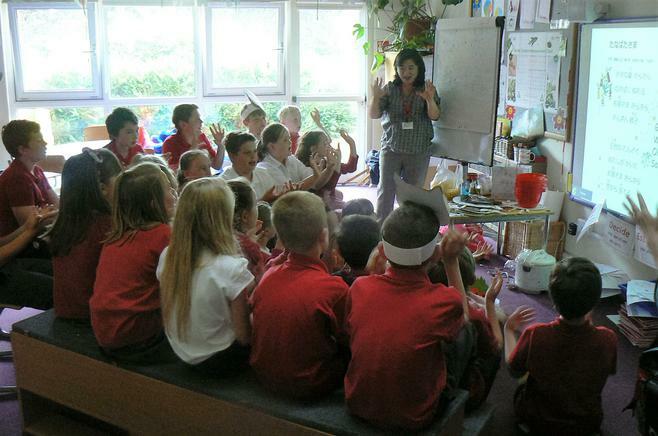 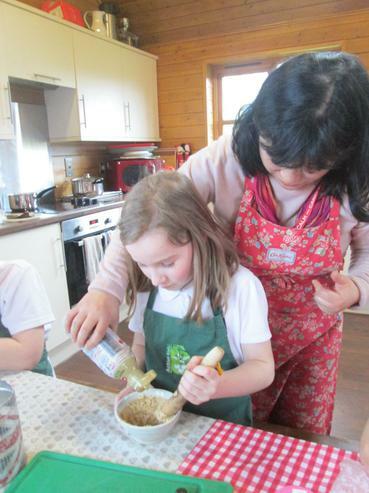 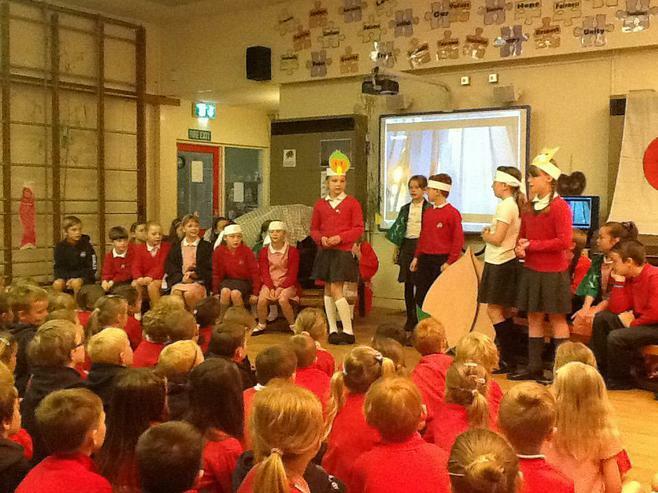 Madley Primary School is linked with Amaji Primary School in Hyogo Prefecture in Japan. 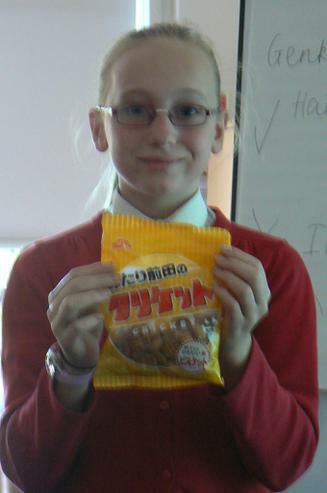 We exchange messages and photos through the Japan UK Live website. 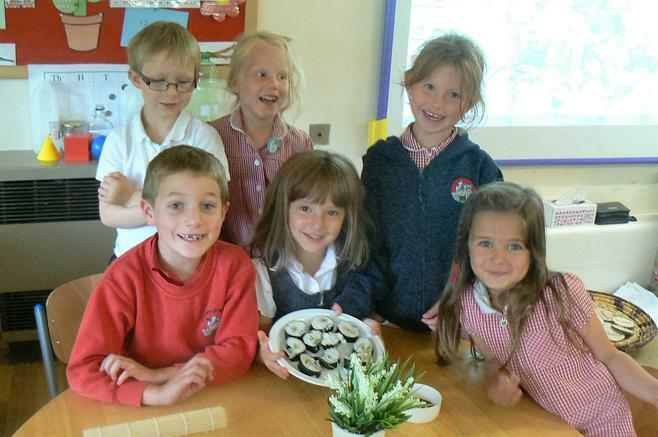 The children from Amaji sent us an exchange student - a cuddly sheep called Amahime who has been visiting our children's homes and learning about school life at Madley. 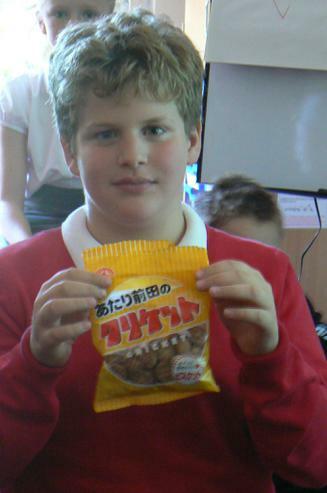 In return, Max the Madley Bear travelled to Japan and has been enjoying meeting Japanese children, tasting Japanese food and visiting their homes. 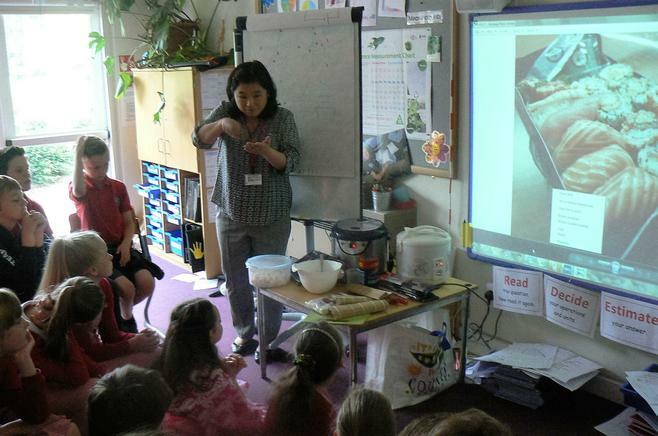 We put photos and news about Max and Amahime's adventures on the website. 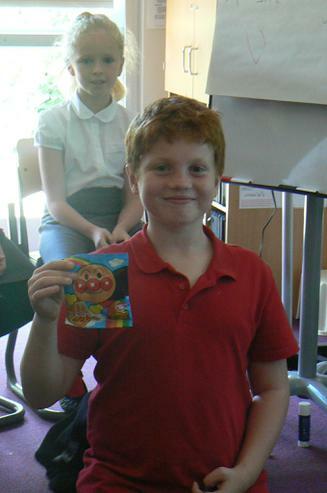 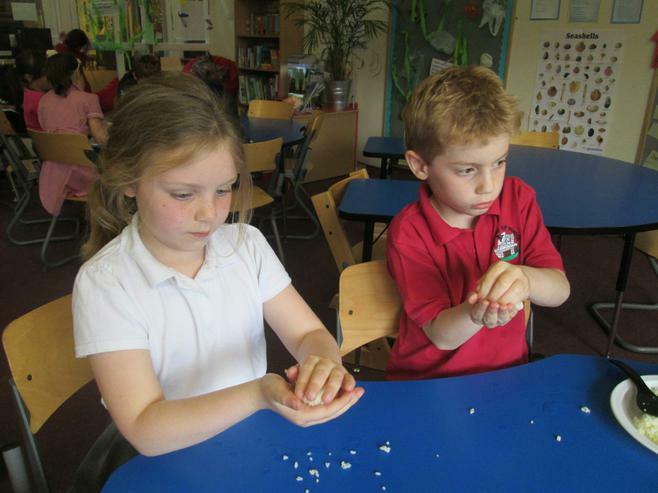 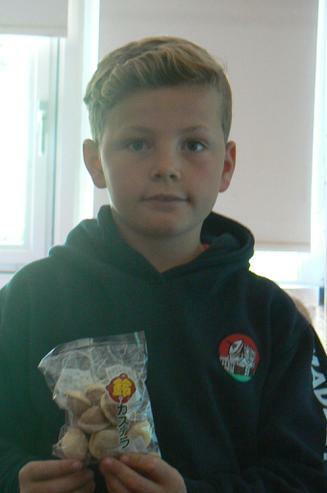 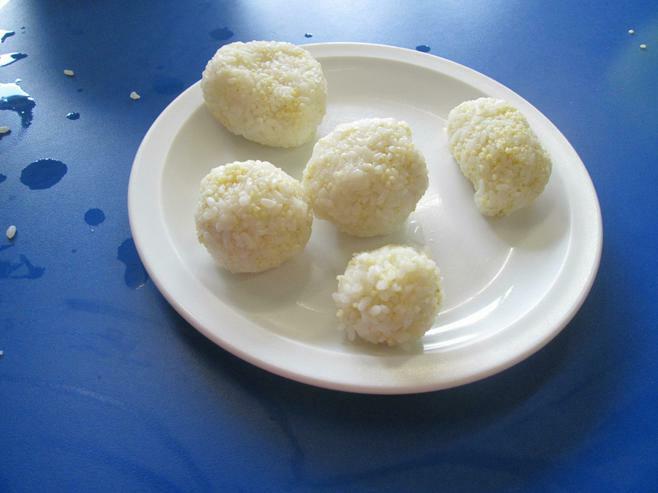 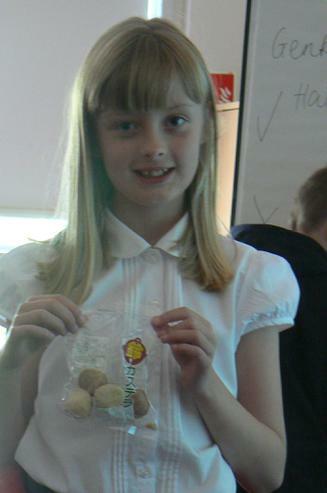 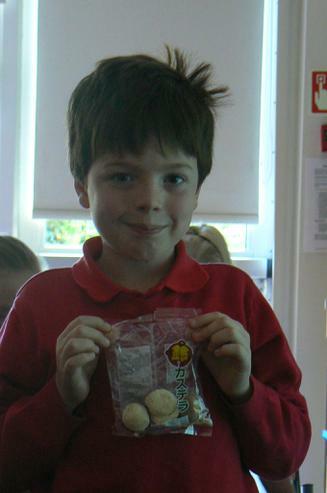 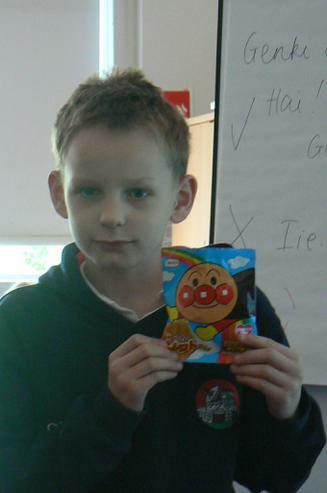 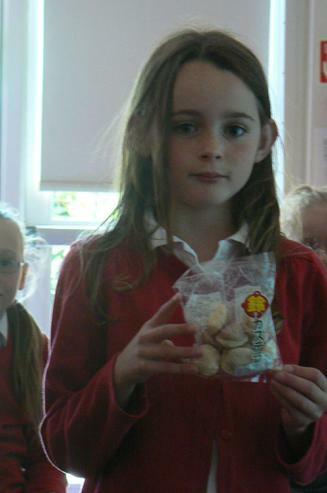 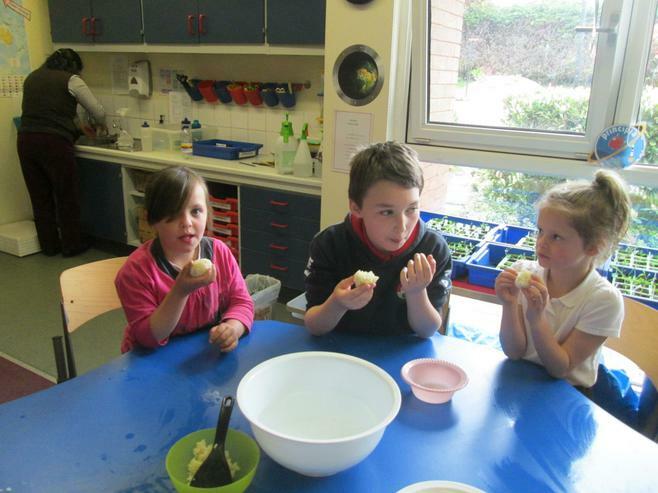 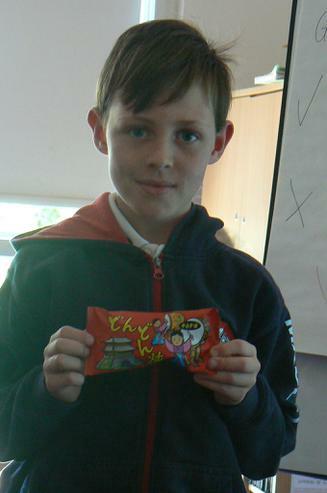 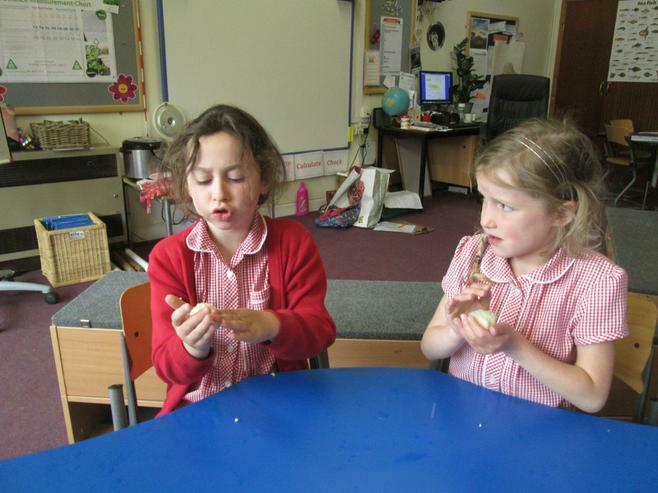 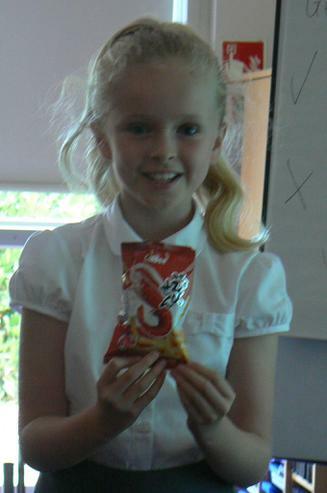 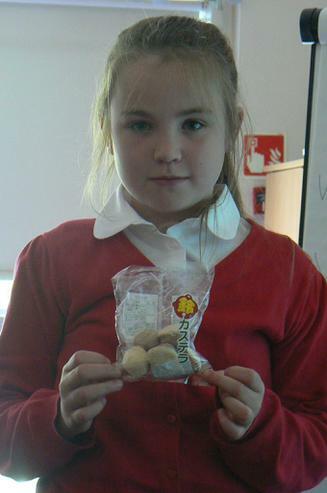 More recently, the children at Amaji sent us some Japanese snacks to try. 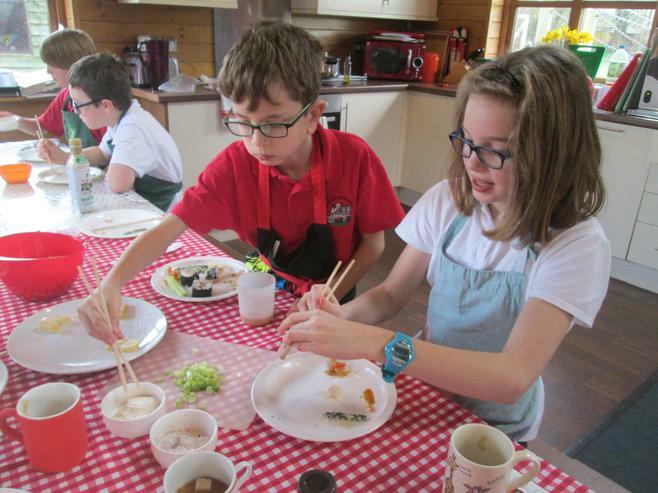 We tasted them all and are writing postcards to say what we thoughts (and arigato gozaimasu!) 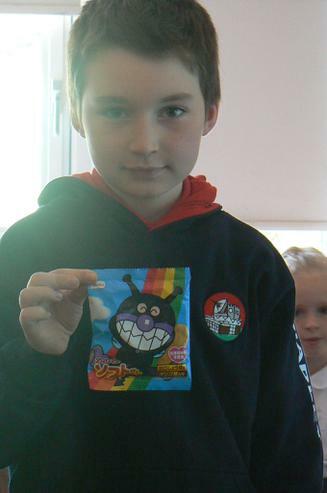 to our friends in Japan. 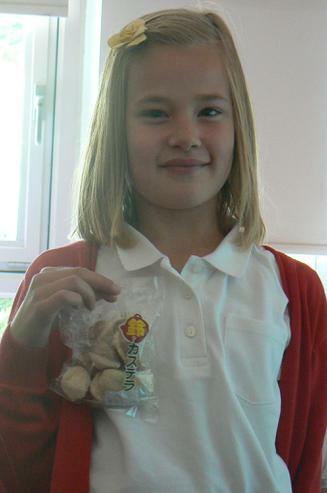 Kids Web Japan Find out more about Japan, including the latest Japanese technology! 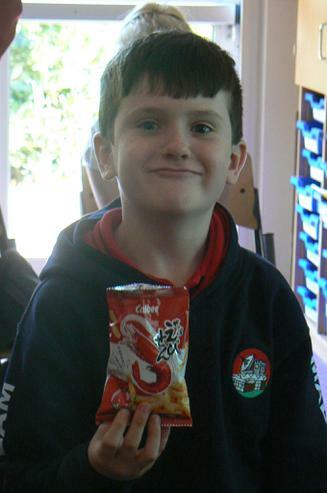 Taste test - Japanese children's favourite snacks!